At the very least, we probably don’t go into the kitchen thinking we’re going to whip it up for a family brunch on a regular basis. And in all honesty, that’s probably the best course of action when you have a dish usually comprised of white bread, Canadian bacon, egg, and a butter-yolk hollandaise. But I like that fancy-special feeling. Can’t we just have a nice brunch, say, every weekend or so? Let’s take this overdone dish and brighten it up a bit, make it manageable for weekend cooking – it totally is – and serve it up in style. Wash + pat dry the basil leaves. Shred 4 of them and place in a small bowl along with the 2 T. olive oil. Microwave 20 seconds to help flavor the oil with basil and set aside. Prep the tomatoes by washing and slicing into ¼” thick round slices. 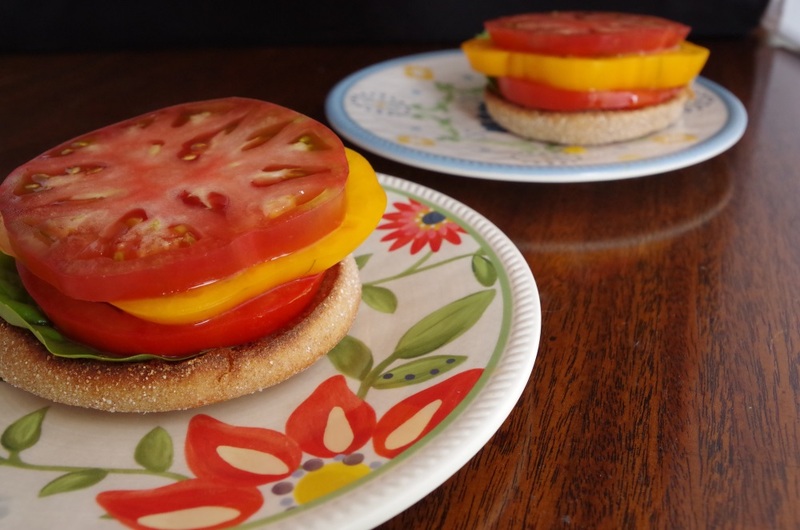 The middle – read: largest + flattest – slices of each tomato will be used for topping the muffins. The ends of the tomato can be chopped up and saved for a salad or something else. Prep the English muffins by brushing the top and bottom of each lightly with the basil oil and toasting – either in a toaster or under the broiler, (careful not to burn them) for about 1-2 minutes. Place the English muffins on plates, top each one with two basil leaves, and set nearby. Place a medium to large pot containing 3-5 inches of water over a burner set to high heat. Add the vinegar and salt and bring nearly to boiling. Meanwhile, place a small saucepan over low heat and add the goat cheese and almond milk. The cheese just needs to melt and keep warm for a few minutes before we thicken it. Carefully let the egg – yolk needs to be intact, of course – slide into the middle of the vortex. If you can, keep spinning the water without hitting the egg, and let the egg cook about 4-5 minutes before removing carefully and placing in a separate bowl filled with tepid water. Repeat with the next three eggs. Don’t worry if this is a little iffy of a process if you haven’t poached an egg before. Guess what? This was my first time doing it! They were not perfect, but no one will know or care as long as the yolk stays together and you smother them in cheese later. When all of the eggs are done, finish the goat cheese sauce – aka faux hollandaise sauce – by bringing to a simmer and reducing to a nice saucy thickness – you’ll know it by the way it coats your spoon without being too drippy – about 5-10 minutes. With the slotted spoon, remove each egg from the water and transfer them to the cheese sauce. Warm them up about 5 minutes, gently moving around the pan and coating with simmering cheese. Now, to make it pretty. Top each English muffin already covered in basil with 3 different colored slices of heirloom tomatoes. Brush the top one with a little more basil oil. Finally, adorn each one with a cheese-covered poached egg, a spoonful more cheese sauce, freshly grated pepper, and a sprinkling of salt.